Donating your tickets to our troops and veterans is easy, just read over this page. The directions and links to donate are below. The Veteran Tickets Foundation (Vet Tix) is a national 501c3 nonprofit founded by veterans dedicated to support and honor the U.S. military community, veterans and their families. The Vet Tix mission is to provide tickets to sporting events, concerts, performing arts and family activities aimed at improving mental welfare and enriching the lives of military service members and veterans. We serve ALL branches of the US Military currently-serving, honorably-discharged veterans and their families as well as the immediate family of those Killed in Action. Since 2008, we have given out over 6.5 million tickets and are active in all 50 states! We know that strong family bonds and community involvement are essential tools for Veterans during active duty, post-deployment, and post-service years. Providing event tickets to the US military community shows gratitude for their years of service and encourages them to be active with their families and communities. Receiving tickets in honor of their service allows veterans to feel proud of their military time, which helps build a positive identity. Vet Tix offers such a diverse range of events that it is easy and appealing for vets to use our services, regardless of age or physical ability. We make it possible for retired veterans to take their grandchildren to Disney on Ice, for a family to enjoy an afternoon together cheering on their local team and to experience to magic of the Nutcracker ballet. Vet Tix offers multiple tickets allowing veterans to go with family and other veterans. Events that connect veterans and family builds stronger relationships. Repeated experiences at a range of events helps veterans build a better social structure, both within their families and their communities. The overall result is a higher quality of life. Thank you so much to Vet Tix and the generous donors for the tickets to Disney World! We had such a great time and made a lot of great memories as a family. 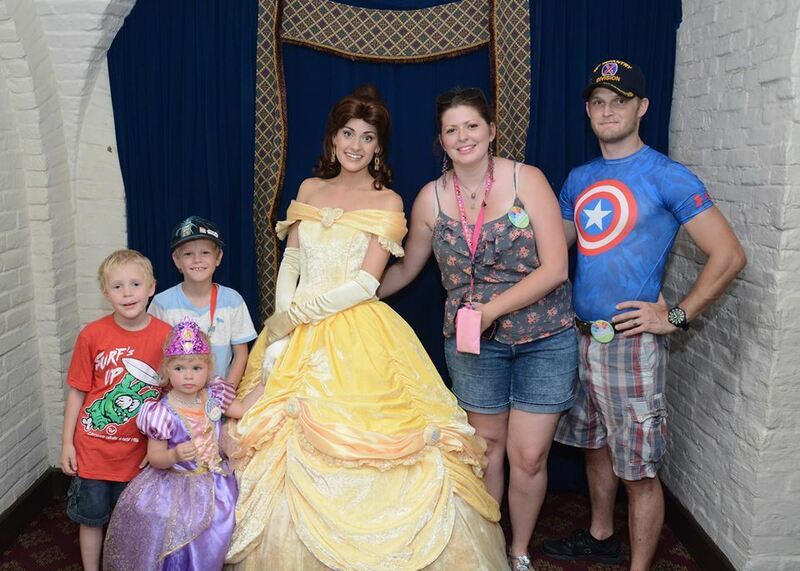 This was our first time getting to go on any kind of trip with my boys, Olivia's stepsons, so it was all 5 of us and was awesome watching all 3 kids have a magical time together! None of us but Olivia had ever been to FL and probably never would have been able to if it hadn't been for this! Thanks so much again! Why do our donors love us? Vet Tix provides a rewarding and simple way for donors to give back! Vet Tix enriches Veterans' lives, but we are also a benefit to donors. Since Veteran Tickets Foundation is a 501c3 non-profit foundation, individual ticket holders and businesses can receive tax deductions for their donations which they would not receive by donating directly to bases or military families. The Vet Tix system is transparent. We are independently GAAP audited and have been at 96.5% to program or above each year. Venues, artist, teams get to know that their tickets are used by our Military and our Veterans. Our verification system ensures that only qualified people get access to tickets and discounts. We provide easy methods to donate shipped, will-call, print at home, or mobile delivery, with complete tracking along the process. Click here to see feedback from other Donors. Choose the donation type below. Once we receive the donated tickets, we will enter them into our system and issue you an in-kind receipt. After the event has taken place, we will send you a link in an email with the feedback messages from the troops that went to the event. Please thoroughly read our private donation instructions. We can only accept tickets that are shipped, will-call, print at home, or mobile delivery), or Paper (Hard). If you have read and understand our donation rules and still qualify to donate, please follow the instructions and complete the form below. *Print at home tickets must be transferred to us no later than 24 hours before the event date for WEEKDAY events and no later than 48 hours before the event date for WEEKEND events. We can ONLY accept your print at home ticket donation if they are sent to us via an Electronic Ticket Transfer Invitation from the major ticketing website you received your tickets from (TicketMaster, etc...) or from your season ticket holder account. Any donated print at home tickets MUST come to Vet Tix through an invitation link from the issuer of your print at home tickets. Please note: We are unable to accept any digital tickets that are sent as an attached PDF. Only digital tickets transferred from a third party website. This ensures that Vet Tix will be the ONLY holder of the new bar codes for the donated tickets. If you are still willing and able to donate your print at home tickets, please initiate the transfer, asap to: tickets@vettix.org and fill out the form below. Please provide your contact information in the transfer notes, so we know who donated the tickets. If you require a name for the transfer please use VET as the first name and TIX as the last name. *3rd-party tickets must be transferred to us no later than 24 hours before the event date for WEEKDAY events and no later than 48 hours before the event date for WEEKEND events. We can ONLY accept your 3rd-party ticket donation if they are digitally transferred to us via the major ticketing website you received your tickets from (TicketMaster, Flash Seats, etc.). This ensures that Vet Tix will be the ONLY holder of the new bar codes for the donated tickets. If you are still willing and able to donate your 3rd-party tickets, please initiate the digital transfer asap to: tickets@vettix.org and fill out the form below. If you require a name for the transfer, please use VET as the first name and TIX as the last name. * Paper Tickets must be in our office no later than EIGHT days prior to the event date. Be advised that we DO NOT accept PDF tickets that have been printed and then mailed to us. When mailing, please include your email address, postal address, and either your name or the name of the organization that is making the donation so that we can get you a completed in-kind receipt. Additionally, please fill out the form below. This form must be completed along with your donation, regardless of the donation ticket type. Please thoroughly read our Organization/Venue/Team donation instructions. We can only accept tickets that are shipped, will-call, print at home, or mobile delivery. If you have read and understand our donation rules and still qualify to donate, please follow the instructions and complete the form below. If you are an organization, venue, or team please initiate the transfer to us via email at: tickets@vettix.org or digital transfer through a ticketing website and fill out the form below. If you are a team/venue that would like to donate tickets to leave at your will call booth, please fill out the form below to provide the necessary details for your donation. Thank you to Vet Tix and Jacksonville Icemen for the tickets to the game. My grandkids, my wife and I really enjoy the games. Really grateful to be there on military appreciation night. 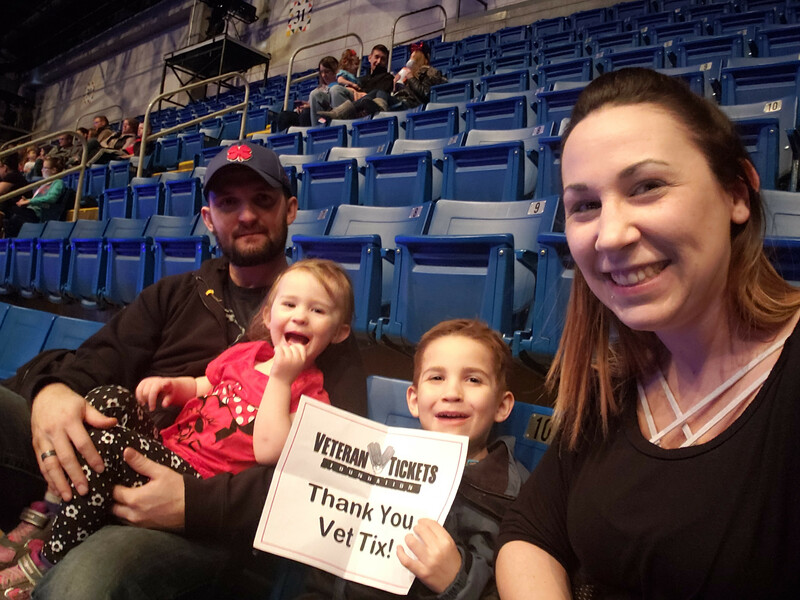 Thank you to all the 19 donors and Vet Tix for making Disney on Ice available to my family! I was able to take two of my children, and they had an amazing time. I must add that I loved the show as well! My 3 year old daughter danced and sang with the characters. My 5 year old son is on the autism spectrum and SAT STILL (this is rare). He focused intensely on the characters and their stories! It was amazing to see him so interested and focused! I do not get these moments often. So again, thank you to Vet Tix and all the donors who gave me this experience with my beautiful children - memories I will never forget! THANK YOU!!! This show was amazing and my daughters loved it! I am grateful for this organization. Without Vet Tix and the donation I would not of had the opportunity to take my family to this show.